Don't Agonize Over Pricing !!! Price Your Work With Confidence! But what should I charge?” has long been the cry of interior designers, decorators and soft goods fabricators. Many of us entered the interior design industry because of our love for design, textiles and/or sewing, yet we are often unprepared to put a value on our time and talents. In 2000, Kitty Stein answered with her inspiring book Price Your Work With Confidence! Kitty Stein was a 24-year veteran of the window coverings industry when her book was first published. She earned her business education through hard work and research. Her goal in writing Price Your Work With Confidence!was to encourage all small business owners to develop a strong business mindset and to stop working long hours for little gain! Price Your Work With Confidence! has done this and much more. It has taught many small business owners, myself included, the importance of keeping timings, watching the basic expenses, and making the necessary investments to grow a business. Step by step, Kitty walks us through the accounting worksheets, explaining in clear and concise words the accounting terminology, the necessity of compiling the numbers and the steps towards building a price list. As a result, we have experienced the joy of increased confidence and increased profits. Price Your Work With Confidence! 2nd Edition will take you to a new level of business acumen and awaken you to a world of possibilities in growth potential for yourself and your business. While written for the design industry, the information in Kitty’s book is timely and universal to all businesses. It is my honor and pleasure to re-issue this book to a new generation of window coverings professionals and other small-business owners. 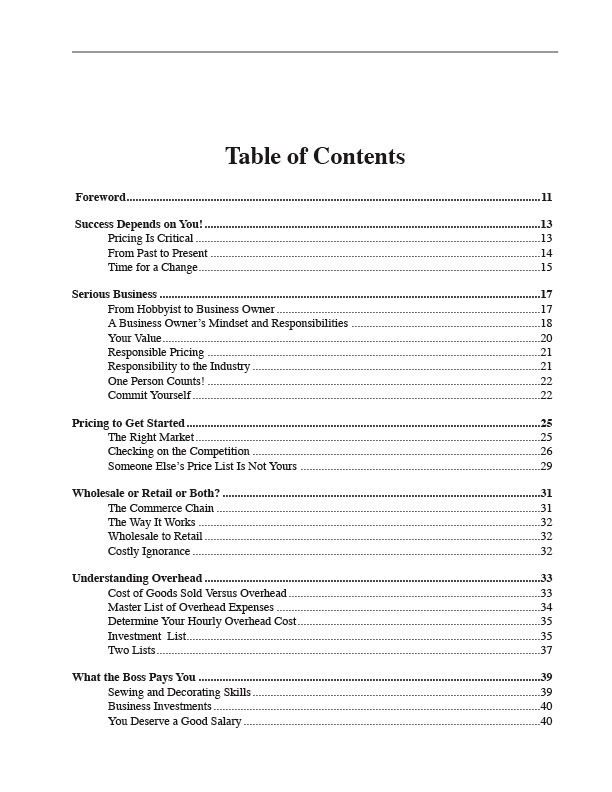 The book has been updated to reflect today’s resources and online business networking. The new workbook format is praised as being user-friendly with worksheets that are easy to access and copy. This will always be Kitty’s book and she will always be a mentor and champion for the window coverings industry. Kitty’s wisdom is served with a strong faith in God and delivered with a very firm hand. Her love for the industry and everyone in it overflows on every page, and her legacy continues in this jewel of a book. and fill in the blanks with your business numbers. • I am valuable for my sewing skills, my creative skills, my knowledge and my experience. • I am valuable because there are so few others like me in the industry. • I will charge a price for my service that is fair to me, my customer, and the window coverings industry. I will reap the comfortable profit that I deserve. • I will take control of my business and learn how to make this possible. If you cannot make this commitment, then close this book and go back to decorating and sewing “home dec” as a hobby and for free. Enjoy what you do, but do not charge for your services if you will not charge fairly. I love to crochet, but I would have a hard time charging what I believe my skill, time and efforts are worth to make business out of it. Therefore I do it free for family and friends. You do not want the burden of hurting a whole industry because you are not charging fair prices! Yes, one weak link in the chain matters! Fabricating and selling window coverings for money is a serious business! It is time to get serious about pricing and make the profit you so justly deserve! Kitty Stein enjoys a stellar reputation in the window coverings and soft furnishings industry as a professional workroom expert, consultant, columnist, seminar speaker and author. Kitty's web site and consulting services were a valuable resource for serious workroom professionals for many years. "In concise, easy-to-understand language (even for someone who never went to business school or took a management class), Kitty provides practical, down-to-earth advice. In fact, Kitty's writing style is so friendly and personal that it's actually fun to read information that otherwise might be considered dry." Kay L. Pegram, author of Marketing & Promotion from A to Z for Window Fashions Retailers and Interior Designers, writer and speaker on marketing for the home fashions industry. "A wonderful educational tool which we have needed in our industry, specific to our industry, by a person who knows and understands the business of window fashions from its many aspects. Thank you for seeing this need and using your talents to put it together!" Donna Rolsma, owner of Sew Much More and past president of WCAA. 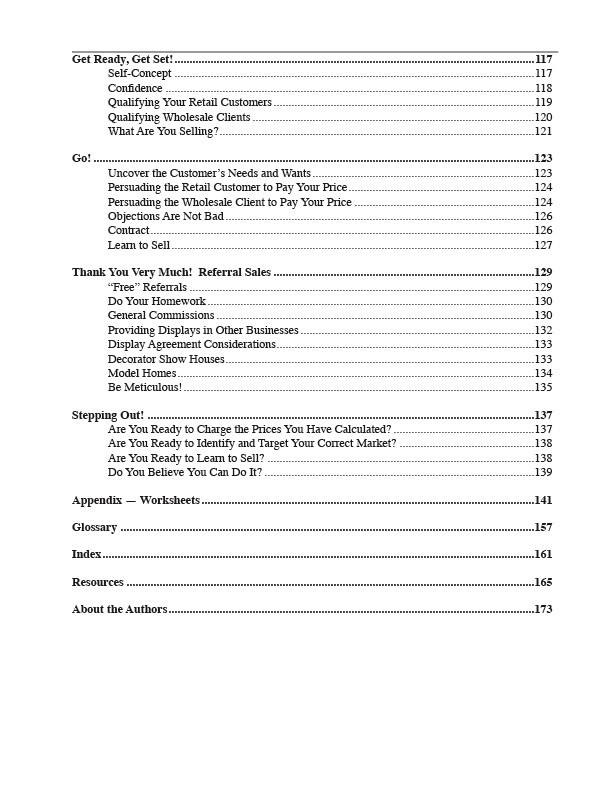 "The easy-to-understand format will help anyone facing the challenges of pricing their work. This book will raise the level of self-esteem for the seamstress." LaVelle Pinder, owner of LaVelle Pinder Decorating, national speaker in the window coverings industry. 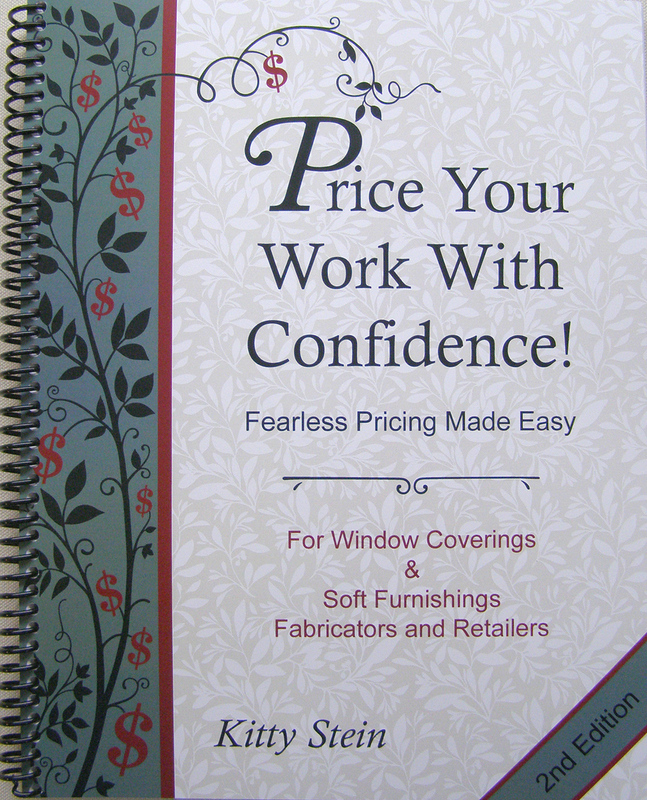 "Price Your Work With Confidence is truly a gift to window covering professionals! 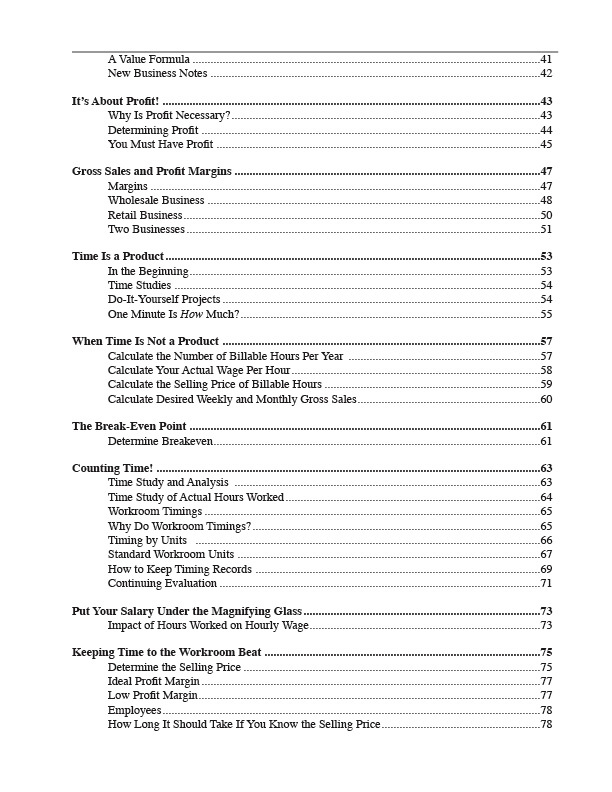 This comprehensive guide speaks in plain language, covering all the "nooks and crannies" that make profit a natural outcome. No doubt those who implement the concepts, methods and procedures (not to mention her awesome forms) will shave years of struggle from their business development! 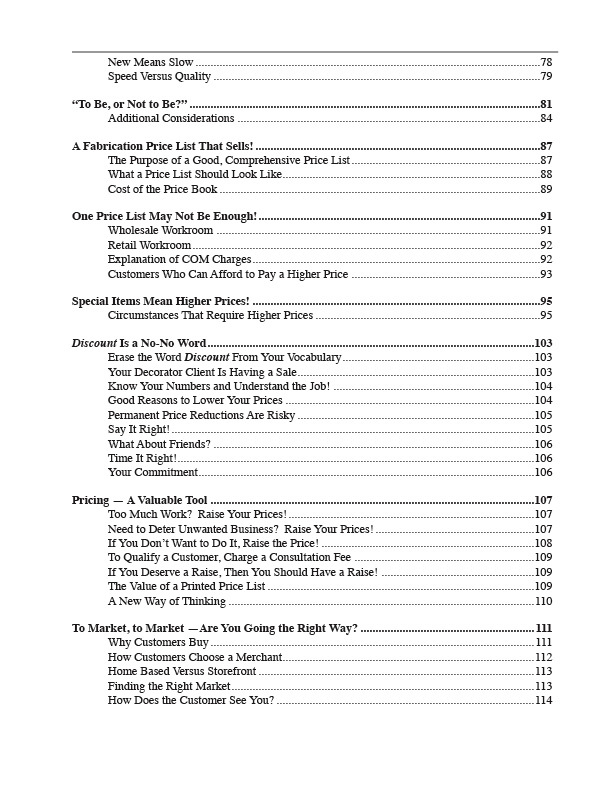 A must-read for the serious and profit-minded in our industry!" Sally Tucker, Visionary Concepts, designer of Mastervisions, industry speaker. 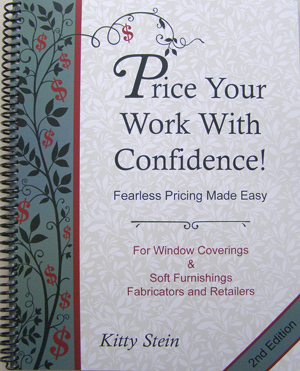 "Kitty Stein's book on pricing is a Godsend to the window fashions industry. Whether you are new to the professionl or have years of experience, you will find something to learn in theis concise and frequently entertaining book. My twenty years in Interior Design have taught me that most designers and workrooms don't go out of business due to lack of talent or ability. It is their pitiful lack of business, marketing , and sales skills that do them in. This book could be the answer for many who have raised prayers to the heavens for so many years." Susan Dudics-Dean, Interior Designer and national speaker on Interior Design.